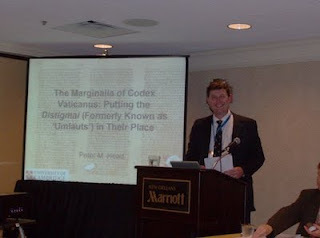 ”The Marginalia of Codex Vaticanus: Putting the Distigmai (Formerly known as 'Umlauts') in Their Place"
Phil Payne, who discovered the distigmai and has dated them to the 4th century (which Head thinks is the "wrong place") was sitting on the frontrow. Don't ask me about the funny hat Peter is wearing on the photo. I have never seen him wear it before. Maybe it is a special for SBL, to create an effect. Unfortunately I don't have time right now, here in the lobby of Sheraton Hotel, to summarize Peter's whole paper, but it was divided into seven points, so we will see how far I get. PH briefly showed some examples of the distigme and charts of distribution. The total number is a bit uncertain, approximately 800 (some are unclear). Payne thinks some distigmai are original to the scribe working in the 4th century. This standpoint has been accepted by Miller, Epp, and others. Payne's main case is that these distigmai are in the apricot color ink. At the last meeting Payne showed some statistics trying to demonstrate (with NA27 as a basis of comparison) how the distigmai corresponds to textual variants. Peter Head argued that the distigmai all belong to one unified system that was added some time in the 16th century. The feature is Interesting for the history of textual criticism. Head emphasized several times that he was not persuaded by the appeal to the ink color. On the other hand he agreed with Payne that the distigmai mark textual variation, and that the different colors do suggest more than one movement through the NT text (they were obviously not added in e.g., one and the same day). The best place to look when establishing a relative chronology is the place where there is interferene between the different systems. The more ancient system will have a more consistent pattern, whereas the more recent will wary in its placement as other older items interfere. 3. The oldest stage: the diple. This system of adding the diple in the margin of an OT quotation [TW: and I think also at some points extrabiblical material] is original to when the codex was first produced. There are totally 16 places of interference between the systems, where the placing of distigmai is accomodated – the diple is never accomodated. Part 2 will follow in another post. Now I am soon off for dinner. Hmm. How does Payne account for the umlaut/distigma next to Hebrews 9:18, on a minuscule supplemental page? I think he thinks some were added later. Now he claims that those with apricot color ink are the old, but that some were reinforced and some added later, like the example you mention. How does one pronounce "diple" and "distigmai"? What I am not sure of is the "di" in both words. Conspiracy Against Users of Internet Explorer?